Andrei Zolotov reports from the city of Sarov, one of the most secretive places in the former Soviet Union – the birthplace of its atomic bomb and still a center of the Russian nuclear industry. After an overnight trip from Moscow, the train chugs into a tiny, single-track station and stops at closed metal gates crowned with barbed wire. Some passengers disembark and walk to the nearby checkpoint where soldiers match their IDs against a list of authorized guests; others wait to be checked on board. The city of Sarov, surrounded by a thick forest, is one of the most secretive places in the former Soviet Union – the birthplace of its atomic bomb and still a center of the Russian nuclear industry. But it is also home to one of the country’s most revered monasteries, now inaccessible for pilgrims and manned by just four dedicated monks. In recent years, a long-simmering debate around the city – to open it up or keep it closed – has drawn in a powerful new player, the Russian Orthodox Church. “Here, people simultaneously pray for peace throughout the world and make things that can blow that very same world to pieces,” Pavel Busalayev, a prominent iconographer, said last month at a gathering where local residents and church-affiliated visitors from Moscow and St. Petersburg met to discuss the city’s dual-identity dilemma. Sarov disappeared from Soviet maps in 1946, transformed by fiat from a minor provincial town into a key site for the research and development of nuclear weapons – some of which stand on display in a strict-ruled museum. The location was ideal: not too far from Moscow, hidden by woodland, but with functional buildings already in place. Some of those buildings had once belonged to the sixth largest monastery in pre-revolutionary Russia. Its bell tower still dominates the skyline, but has no bells: It survived only because it was topped with television transmitters, which were removed just last year. The town’s main street barrels through the monastery’s 18th-century compound. The main churches were blown up by Soviet authorities in the 1950s, a quarter-century after the cloister had been closed and converted – first, to a juvenile prison, then to a military factory. One of the churches left standing served in Soviet times as a theater. Today, Sarov – best known by its longest-lasting Soviet code name, Arzamas-16 – prides itself on facilities such as Russia’s largest supercomputer, Europe’s largest station for laser-induced thermonuclear fusion and Europe’s largest linear particle accelerator. The beating heart of the town is the Russian Federal Nuclear Center – also known by its Soviet-era acronym VNIIEF – which employs about one-fifth of the total population of 92,000. While Sarov looks like an ordinary Russian town – with architecture ranging from tidy brick buildings and imposing Stalin-era facades to late-Soviet blandness and shiny plastic-faced shops – it is still very much one of Russia’s 40 “closed cities,” or ZATOs, an archipelago of restricted-access towns, each overseen by one of several government agencies: state nuclear monopoly Rosatom (as in the case of Sarov), the Defense Ministry, the Russian Space Corporation or the Ministry of Industry and Trade. According to Igor Babichev, a parliament staffer and the leading authority on ZATOs, the closed cities are home to 1,269,948 Russians, or a little under 1 percent of the country’s population. Their security regimes vary greatly, but Sarov’s is one of the strictest. The off-limits area surrounding Sarov – a total of 232 square kilometers – is ringed by two parallel, barbed-wire fences. Between them lies a no-man’s land of upturned soil, where footprints are easily visible and underground sensors register any unauthorized movement. To this day, VNIIEF employees with a security clearance cannot travel to countries other than Belarus, Kazakhstan and Ukraine unless on officially sanctioned business trips. All other foreign travel can take place only in locally organized groups accompanied by an officer of the Federal Security Service (FSB). Foreign scientists who get official permission to visit Sarov cannot bring along their spouses. Even those Sarov residents who don’t work at the center and don’t have other security clearances face restrictions: While they can travel abroad, they can invite only their closest relatives to visit the town. This near-hermetic state makes it difficult for the Russian Orthodox Church to restore its famed cloister, the Sarov Monastery of the Dormition, to its pre-Soviet glory. In the late 18th and early 19th century, the monastery had been home to one of Russian Christianity’s greatest saints, Seraphim of Sarov, a mystic, healer and preacher of attaining the Holy Spirit through love – hardly a standard bearer for military might. When clerics recovered St. Seraphim’s relics in 1991 from the store rooms of Leningrad’s Museum of Atheism, they could not display them at the monastery, as ordinary people would have been barred from visiting. Instead, the relics went to what eventually became a flourishing convent with hundreds of nuns in Diveyevo, just 40 kilometers from Sarov, which attracted 1.7 million pilgrims last year, according to the convent’s publishing department. Nonetheless, the Russian Orthodox Church has been slowly working to raise the monastery’s profile for more than a decade. In 2003, some of its church buildings – though not the main one – were restored in time for the centennial of St. Seraphim’s canonization, a celebration attended by many dignitaries, including the Russian church’s then leader, Patriarch Alexy II, and President Vladimir Putin, who has been a major force in boosting the prestige of the Russian Orthodox Church in the country’s life over the past dozen years. 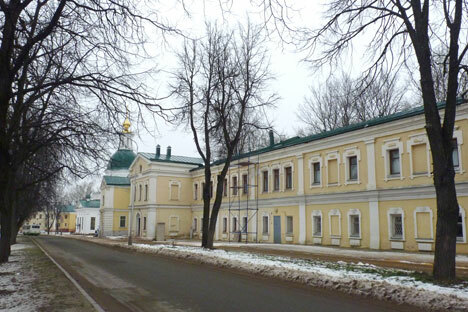 “Ten years ago, neither the monastery, nor the church existed in the minds of [Sarov’s] citizens or the city fathers at all,” said Sergei Chapnin, executive editor of the Journal of the Moscow Patriarchate, who visited the town often in the early 2000s. “We had to explain to them, at length, in a complicated and therapeutic way, that here is a monastery with 300 years of history, let us have respect for it and let the church in,” he added. While representatives of the nuclear industry have made some overtures to the church, they have likewise made clear their belief that the city of Sarov must remain closed. “While speaking of the mission to defend our fatherland, people [who develop and produce nuclear weapons] definitely have some conflict in their souls,” VNIIEF director Valentin Kostyukov told the gathering in December, hinting that the church may help scientists grapple with an aching conscience. “Yes, they are creating weapons of defense, but some internal questions arise – what’s the purpose, what for?” he added. At the same time, in terms of public access, Kostyukov unequivocally favored keeping Sarov closed. Kostyukov is not alone. Though some Sarov residents acknowledge that the city’s closed status may hinder development, many others regard it as an island of security in a wild, unpredictable world. “Being part of a closed city gives you a feeling of comfort and protection – that people of this city are all together your family,” said Svetlana Rubtsova, a linguist and tour guide. That sense was particularly strong in the turbulent 1990s, after the collapse of the Soviet Union stranded ZATOs with little support or funding at a time of melting savings, disappearing food stocks and skyrocketing crime throughout most of Russia. Moreover, Sarov, though administratively linked to the region of Nizhny Novgorod, lies on the territory of Mordovia, whose ethnically non-Russian population had triggered fears of separatism at the time. “We defended it [Sarov] from chaos,” said Dmitry Sladkov, a VNIIEF advisor and organizer of the December gathering, which was the inaugural meeting of the Sarov Discussion Club. Sladkov, an urban planner by profession, moved to the city from Moscow in 1992, in part to protect his children from what he saw as the negative influence of early post-Soviet disarray. Since the dissolution of the Soviet Union, the number of closed cities has dropped from 45 to 40, according to Babichev, the parliament expert. The attachment to ZATOs’ closed status on the part of residents and government officials does not mean the strict rules go unquestioned. In a 2008 article, Sladkov, the urban planner, wrote that security services have become more intrusive in recent years. While in Soviet times the KGB had been secondary to the scientists and engineers, whose work they protected, he said, in recent years many scientists have complained about excessive new limitations imposed by the FSB. “Defense industry employees with security clearance see well which measures are necessary to protect genuine security and which only to maintain the influence of the secret services,” he wrote. Sladkov and others have also pointed out that the secrecy and travel restrictions scare away young scientists, although Kostyukov, VNIIEF’s director, said 32 percent of the center’s 18,500 employees are under 35. “Physical limitations on travelling abroad are probably wrong,” said Andrei Bezyusyak, a young researcher and engineer who came to VNIIEF as an intern from Moscow’s prestigious Bauman Technical University, fell in love with the work and stayed. Meanwhile, the debates about the city’s future trundle on. “Quite a substantial part of the territory of Russia is closed,” said Alexei Golubev, Sarov’s mayor, who also chairs the association of Rosatom’s closed cities. “I want to understand: Is this a norm of our life, and should we eventually come to a closed society that is structured, segmented and where the mobility is low, while only the big cities will be global cities with global citizens living in them?" he said. "In my opinion, Russia needs to learn to live in an open society. All the problems connected with terrorism or nationalism notwithstanding, the path to closed-ness is leading us nowhere,” Golubev added.